Consider the information about the world’s most mysterious places: UFO frequented spots; Bermuda Triangle; sites, where different unexplored creatures were seen; ghost and poltergeist houses; and many other phenomenon places. Tired of crowds of tourists? Bored by popular destinations and laid-back vacations? Want some extra adrenalin into your blood? In need of new experience? Then you’ve got into the right place! Browse through the information to get the expert ideas of how to make your holidays truly unforgettable and extraordinary. Keep off the beaten track with UnusualExperience.Com and see the world you have never seen before. Though people had developed different fields of science and carried out many fantastic inventions, there are still phenomena and events, which can not be explained and studied with the help of scientific method. Periodic UFO visiting of certain areas, obscure disappearances of people, ships and planes at Bermuda Triangle, or witnessing the mysterious creatures all over the world, the ones that are unknown for modern biology. And who knows maybe you are the one who is going to solve the riddles! And if you want just to witness the phenomenon, head for the crypt haunt or the famous places frequented by UFOs and face the unknown! Find out more about various fantastic creatures observed on our planet: Loch Ness Monster, Bigfoot, Chupacabras, Yeti, Ghosts and others. Check out the places where they have been recently seen. Look through the information about UFO and places, where this phenomenon is most frequently observed; read also about the renowned Area 51. Get to know here more about Mt. Shasta phenomenon. Learn about this legendary spot, its location and unique nature. Check out information about Sedona, Arizona and its unusual features. Here you may read about unexplained paranormal experiences in Sedona. 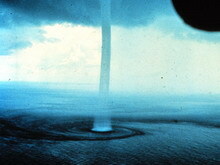 Here you may read about one of the world’s mysteries The Bermuda Triangle. Check out the theories on the reasons of frequented disappearances of boats, planes and people.